A tale of two relatable working stiffs in the 21st century, this debut film breaks global capitalism down into its component human truths and consequences with lucid clarity and gentle humor. In France, hangdog Hervé loses his factory job when the work moves overseas. Young Foued in Tunisia nabs a spot stamping leather in the relocated factory, but quickly realizes the job is still just work—boring and underpaid. The narrative crisscrosses the ocean separating the two men, weaving patterns and parallels that bind them together. Hervé starts a fishing business with his son, but gets bogged down in French bureaucracy; Foued dreams of becoming shop manager, but finds the job’s real benefit is commuting with comely co-worker Karima. As the intercutting quickens, the two lives start to blend. The film backs up its ideas with strong performances and inventive camerawork, portraying blue-collar life without sentimentality. “It’s total crap,” Hervé exclaims in the opening scene; and yet he and Foued keep dreaming and trying nonetheless. Walid Mattar was born in Tunisia in 1980. 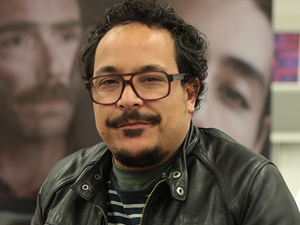 A member of the Tunisian Federation of Amateur Filmmakers since the age of 13, he was the director of photography for several short films and directed his first film, Le cuirasse Abdelkarim (2003), winning prizes at amateur film festivals. With Leyla Bouzid, he co-directed Sbeh El Khir (2006) for the Cannes Film Festival project: “10 Shorts, 10 Points of View.” In 2010, he directed another short film, Condamnations, which won several prizes and awards, notably in Tangiers and Monpellier. Baba Noël (2012) similarly won festival prizes. Northern Wind is Mattar’s first feature.